One of the best things about mac and cheese is it’s adaptability: show me a cheese, and I’ll show you how to macaroni it. Generally speaking, as long as you can whip up a decent roux, you can make a delightful cheese sauce, so don’t fear the less common candidates. However, the better versions bring a full texture profile, with something stringy, something creamy and something salty, so give a bit of thought to your cheese picks. Here, the Gruyere is stringy, the peppery Gouda is creamy, and a salty hit of Parmesan tops it off. So, how do you feel about ketchup on your mac n’ cheese? Does that sound coarse? I have no shame in admitting that I like to dress up certain homemade fare with Heinz’s finest. And while the ketchup question has been dividing households for decades, I think I found a way to reconcile the opinions in this home. Paul –a firm no-ketchup devotee — loves roasted cherry tomatoes, which happen to work for me here, too. All you need is a bit of oil and high heat, which will make the little tomatoes brown, caramelize and pop, then wrinkle and ooze once you remove them from the oven. Easy peasy, and exceptionally delicious. Preheat your oven to 400 F, and lightly grease a shallow baking dish. Boil your macaroni until just short of al dente — they’ll cook up more in the oven. Set aside, and get on with the onions: Melt the butter in the frying pan over med heat, and when the foaming subsides, add the onions, tossing to coat evenly. Reduce the heat and keep stirring the onions until they get gooey and sweet and sticky, then add the garlic, wine and thyme and cook until the liquid evaporates. It should take about 20 minutes, but the good news is, these can be made well in advance. For the tomatoes, simply toss them with the olive oil, spread out on a baking sheet and pop in the oven. Watch them closely, shaking the pan now and then to help them cook evenly. Cook until they begin to pop, around 15 minutes. Remove from the oven, and add a splash of balsamic vinegar. Reduce the over to 350 F.
Now for the cheese sauce: melt butter in a heavy-bottomed pan over medium low heat, then add your flour and whisk the mixture until it turns bubbly and golden (about 5 minutes). Slowly add your milk, whisking constantly, and bring to a simmer. Keep whisking, until the mixture begins to thicken. Remove from heat, and stir in the cheese and seasonings until nice and smooth. Combine the noodles, onions and cheese sauce, and pour into the greased pan. Sprinkle the bread crumbs evenly over the top, loosely tent with foil, and pop into the preheated oven for about 30 minutes, or until the sauce begins to bubble. Take off the foil, turn up the oven to 375, and keep cooking until the breadcrumb top begins to brown and crisp. Remove from the oven and let it sit for 10 minutes before serving. 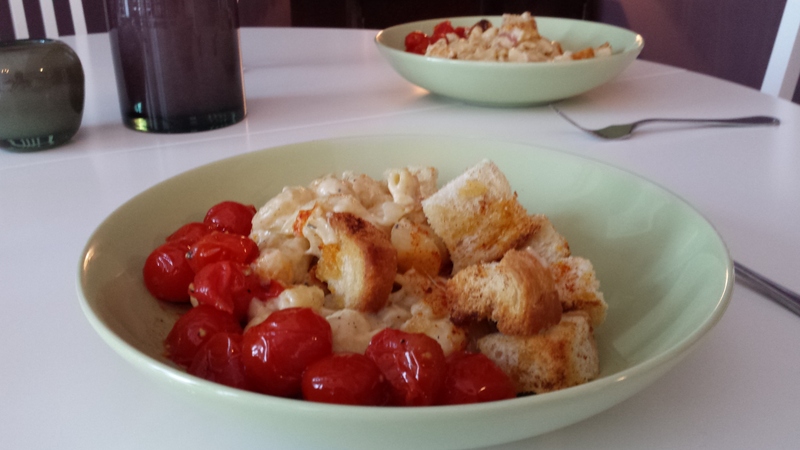 Dish up the mac n’ cheese with a big spoonful of the roasted cherry tomatoes, and enjoy. Looks so good Angie! Looking forward to trying this. Hope you and Paul are well. Thanks so much, Mira! We are doing just great over here. I hope life is treating you very well!